New Political Religions, or an Analysis of Modern Terrorism. Barry Cooper. Columbia, MO: University of Missouri Press, 2004. 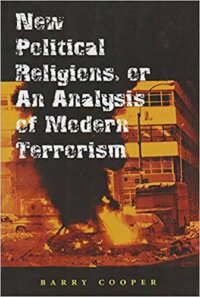 Barry Cooper’s New Political Religions, or an Analysis of Modern Terrorism. The title puts the reader in mind of Eric Voegelin’s Political Religions, which originally appeared in 1938 and dealt with the murderous mass political movements of that era. In this work, Dr. Cooper has brought his understanding of political theory to bear on what he calls “Islamism,” that fraction of Muslim society which believes it has a God-given task to bring the world under Islamic control, using murder and suicide as routine instruments for conquest. One of the epigrams for the volume is from Graham Greene, “They won’t believe the world they haven’t noticed is like that” – and it was certainly true for this reader! I thought in the years following 9/11 that I had acquired a good grasp of the problems faced by the West and particularly the US, but it soon became evident to me on reading this book that I knew too little. The book is divided into five chapters. The first, “Context,” brings in Hannah Arendt and Voegelin on totalitarianism, terror and spiritual disease in light of 9/11. The second, “Concepts,” explains “pneumopathology” and “second reality” and discusses them in relation to the Japanese revolutionary movement Aum Shinrikyo. This lends needed emotional distance for the analysis because it is not about 9/11 directly. The third chapter, “Genealogy of Salafism,” explores the history of Islam and the related topics of Ibn Taymiyya, Wahhabism, the Muslim Brotherhood, etc. The fourth chapter, “Genesis of a New Ideology,” explores the source of the modern problem in the writings of Qutb in Egypt, the enshrining of scriptural ignorance, and the heating of the pot by Khomeini and other Shiites. Bin Laden and Al Qaeda and the theological problem of suicide complete the chapter. The last chapter, entitled “Counternetwar,” explores the need to modify traditional military methods in order to deal with the elusive networking of the enemy, made possible in large part by modern cyber technology. There is an astonishing appendix on history and the Koran in which the historiogenesis of Islam is explored as is the problem arising for fundamentalists that there are now several varying manuscripts of the Koran which have not been acknowledged, because while the bible has various texts which cause problems, this is seen to be impossible for the Koran since it was handed down directly by God. Both Voegelin and Leo Strauss are used to set the argument. “. . . societies that are not organized as states do not have armies; rather, they are armies. In principle, therefore, where armed force is directed by organizations that are not states, against organizations that are not armies, by people who are not soldiers, modern Clausewitzian categories are, if not eclipsed, then cast into doubt as the only way that conflict can be understood” (28). “There is, therefore, an inherent friction between commonsense reality, the common reality of worldly existence, within which the terrorist like everybody else must live, and the occult reality within which the terrorist lives imaginatively, an imaginary reality where killing the innocent to impress others is understood to be heroic, altruistic self-sacrifice” (40). “The chief practical consequence of taking part in a cosmic struggle with a satanic enemy is that the enemy must be extinguished. The sentiments expressed by Hussein Mussawi, the found of Hezbollah, are typical: ‘We are not fighting so that the enemy recognizes us and offers us something. We are fighting to wipe out the enemy'” (57). “. . . the appropriate response to God’s scourge, both then and now according to the Muslim vulgate, has been to recover the purity of the early companions [Salafs] of the Prophet [return to origins being a common theme in Judaism and Christianity as well]. . .Central as well was the importance of jihad. . . . It was an important constituent element in the spiritual complex of the terrorist attack of [9/11]” (96-96). “[The British were] powerless to prevent the spread of sentiments of great approbation for Wahhabi achievements. Chief among them was the undeniable fact that Saudi Arabia was formally independent of foreign, and thus infidel rule. Because Saudi Arabia had experienced neither Western colonization nor rule by a Westernized elite, the Saudi rulers could easily and genuinely believe that [Wahhabi] Islam was socially, morally, and religiously superior” (101). “For Islamists, the issue is simple: in Muslim terms, the five pillars of Islam (profession of faith, prayer, the fast of Ramadan, pilgrimage, and charity) amount to a spiritual preparation for war against the enemies of God. . . . the limitations on what can be achieved by worldly action or on what that worldly action may mean, which is established by the world-transcendent dimension of Muslim spirituality, tends to be eclipsed” (119; 109). The transformation of the prohibitions against suicide in the hadiths to the granting of the six privileges of martyrdom to suicides is characterized as a perversion (138) and, “As with the question of the black-eyed houris, the simplifiers and vulgarizers clearly dominated the current popular debate. It is now dogmatically established and lies beyond question self- martyrdom, istishad, is not suicide, intihar, but indeed the highest form of martyrdom” (141). This book represents a synthesis of enormous historical, religious, and philosophical scholarship by Dr. Cooper who is a professor of political science; it is the kind of work Voegelin did so well. I know of no other political scientist who brings such a level of philosophical penetration to Islamism as does the author. Of course Dr. Cooper read voraciously to prepare himself to write this work and he generously gives tribute in the text and footnotes to his sources. He particularly thanks Peter von Sivers, a well known Voegelinian scholar who specializes in Islamic problems, for guidance through the intricacies of Islamic culture. A book-length argument can scarcely be reduced to a review and I didn’t attempt it. And an appreciation written by a non- specialist must be taken with a grain of salt. Nevertheless one can hope that enough has been shown here to lead the reader to the original. It must be said too that it is a lively read. My attention never wandered.